For all updates in the runup to the Lok Sabha elections 2019 follow our live blog. LS Polls Live: Ram Niwas Rawat to be the Congress candidate from Morena Parliamentary constituency. LS Polls Live: Election Commission of India has seized Rs 399.505 Crore cash, Rs 162.892 Crore worth liquor, Rs 708.549 Crore worth drugs & precious metals worth Rs 318.495 Crore and freebies/other items worth Rs 29.342 Crore till date. LS Polls Live: Congress workers create ruckus at party office in Patna, Bihar over denial of ticket to former party MP Nikhil Kumar from Aurangabad parliamentary constituency. Grand alliance has fielded Upendra Prasad of Hindustani Awam Morcha (Secular) as its candidate from Aurangabad. LS Polls Live: Congress releases list of 12 candidates for Madhya Pradesh. CM Kamal Nath’s son Nakul to contest from Chhindwara, Ajay Singh Rahul to contest from Sidhi and Arun Yadav to contest from Khandwa. LS Polls LIVE: Rahul Gandhi also avowed that he will not say anything against the CPM in his entire poll campaign. LS Polls LIVE: The BJP has announced an alliance with the Rashtriya Loktantrik Party headed by MLA and former BJP leader Hanuman Beniwal on one seat in Rajasthan. Beniwal will contest Lok Sabha polls on Nagaur seat as RLP candidate. 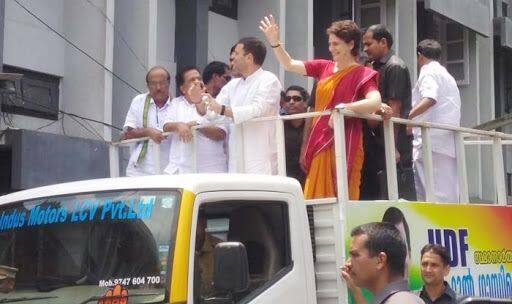 LS Polls LIVE: Congress president Rahul Gandhi and Congress Uttar Pradesh (East) In-charge Priyanka Gandhi begin roadshow in an open vehicle in Wayanad. 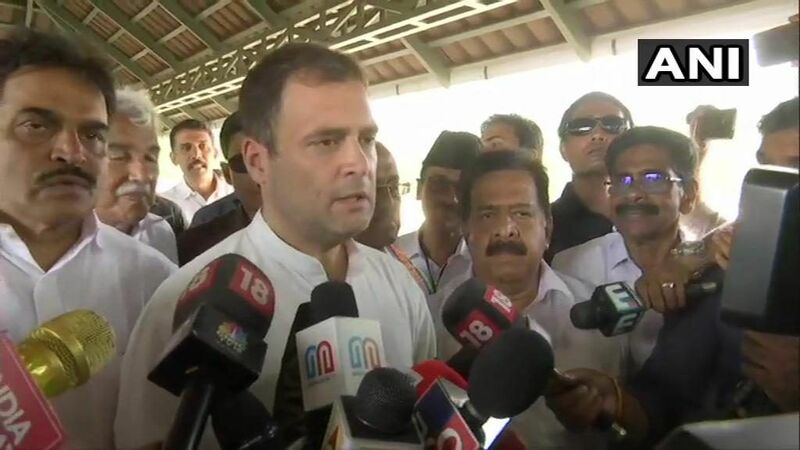 New Delhi: Congress president Rahul Gandhi, who is contesting from Wayanad Lok Sabha seat in Kerala in addition to his traditional stronghold of Amethi in Uttar Pradesh, filed his nomination around 11.30 AM on Thursday. 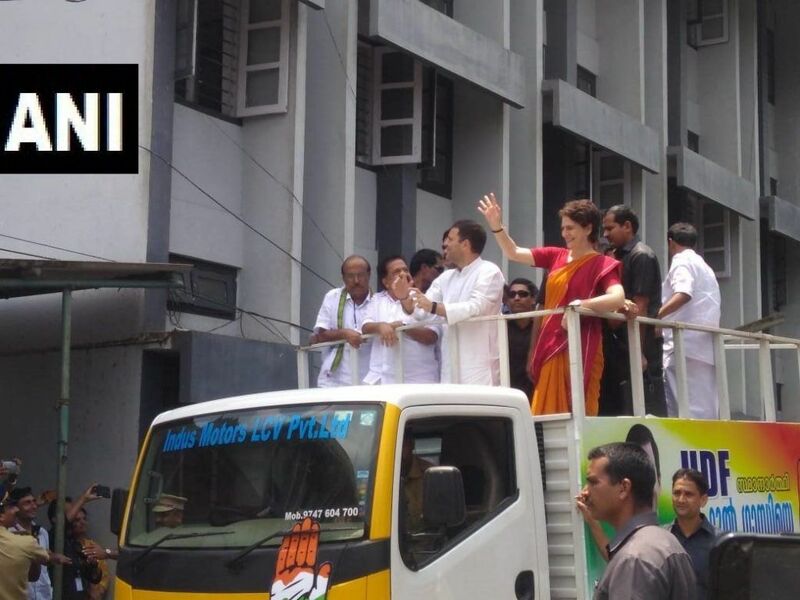 Flanked by sister and Congress Uttar Pradesh (East) in-charge Priyanka Gandhi Vadra, the party chief then embarked on a roadshow. Party workers believe that the announcement of Gandhi’s candidature in Wayanad has enthused the people of the constituency and made a major difference in other states, including Tamil Nadu and Karnataka. “It will get reflected in the voting,” they say. The Congress announced on Sunday that Gandhi would contest from Wayanad constituency, besides his traditional stronghold of Amethi. Gandhi had earlier claimed that the people in South India “feel hostility” from Prime Minister Narendra Modi and said he decided to contest from Wayanad to send out the message that he stands with them. On the other hand, BJP national president Amit Shah will hold a roadshow in Andhra Pradesh on Thursday. Amit Shah will participate in the roadshow on Thursday in Visakhapatnam campaigning for party candidates in Visakhapatnam Lok Sabha and Assembly constituencies. BJP president Amit Shah will also address public meetings in Telangana starting from April 4. He will address people of Warangal and Karimnagar and conduct road shows at Nalagonda and Hyderabad on April 6. Union Textiles Minister and BJP leader Smriti Irani also began her two-day visit to Amethi, the Lok Sabha constituency of Congress chief Rahul Gandhi on Thursday. Irani addressed a Kisan Rally in Parshedpur under the Amethi parliamentary constituency and lambasted Rahul Gandhi for “deserting, betraying and insulting Amethi by filing nomination from another seat in Kerala”.